Sleep Aid Devices Market Segmentation by Key Players - ResMed Inc., Fisher & Paykel Healthcare Limited, Drive DeVilbiss Healthcare LLC, Koninklijke Philips N.V., Sleep Number Corporation, Responsive Surface Technology LLC, Eight Sleep Inc., Simmons Bedding Company LLC, Electromedical Products International, Inc.
A recent market study published by PMR – “Sleep Aid Devices Market: Global Industry Analysis 2013 – 2017 and Forecast 2018 – 2026” consists of a comprehensive assessment of the most important market dynamics. On conducting a thorough research on the historic as well as current growth parameters of the sleep aid devices market, growth prospects of the market are obtained with maximum precision. The report features unique and salient factors that may make a huge impact on the sleep aid devices market during the forecast period. It can help market players to modify their manufacturing and marketing strategies to envisage maximum growth in the upcoming years. The report provides detailed information about the current and future growth prospects of the sleep aid devices market in the most comprehensive way for the better understanding of the readers. Readers can find a detailed taxonomy and the definition of the sleep aid devices market in this chapter, which helps to understand the basic information about the market dynamics, supply chain, key distributors and suppliers, along with the key market participants. This chapter explains how the sleep aid devices market will grow across various geographic regions, such as North America, Latin America, Europe, Asia-Pacific Excluding China (APEC), China, and the Middle East & Africa (MEA). This chapter explains how the global economic factors such as expenditure on health by country, global healthcare expenditure, political scenario, economic scenario, and business environment can impact the sleep aid devices market. Readers can find a value chain of the market along with market dynamics including drivers, restraints, market opportunities, and market trends. In this chapter, the report describes the regulatory scenario of the sleep aid devices market, disease epidemiology, statistics, white space opportunities narcolepsy and obstructive sleep apnea diseases, technology assessment and pricing analysis. This chapter includes a detailed analysis of the growth of the North America sleep aid devices market along with a country-wise assessment including the U.S. and Canada. Readers can also find regional trends, regulations, and market growth based on product type, indication, and end user. This chapter also includes market attractiveness analysis, key market participants, intensity mapping, drivers and restraints and impact analysis. This chapter includes a detailed analysis of the growth of the Latin America Sleep Aid Devices Market along with the country-wise assessment including Brazil, Mexico, and Rest of Latin America. Readers can also find regional trends, regulations, and market growth based on product type, indication, and end user. This chapter also includes market attractiveness analysis, key market participants, intensity mapping, drivers and restraints and impact analysis. This chapter includes a detailed analysis of the growth of the Europe sleep aid devices market along with the country-wise assessment including Germany, the U.K., France, Italy, Spain, Russia, Poland and Rest of Europe. Readers can also find regional trends, regulations, and market growth based on product type, indication, and end user. This chapter also includes market attractiveness analysis, key market participants, intensity mapping, drivers and restraints, and impact analysis. This chapter includes a detailed analysis of the growth of the Asia-Pacific Excluding China sleep aid devices market along with the country-wise assessment including India, China, ANZ, ASEAN and Rest of APAC. Readers can also find regional trends, regulations, and market growth based on product type, indication, and end user. This chapter also includes market attractiveness analysis, key market participants, intensity mapping, drivers and restraints, and impact analysis. This chapter explains the historical (2013-2017) and forecast (2018-2028) sleep aid devices market in China by product, indication and end user, market attractiveness analysis, key market participants, intensity mapping, drivers and restraints, and impact analysis. This chapter includes a detailed analysis of the growth of the Middle East and Africa sleep aid devices market along with a country-wise assessment of GCC Countries, South Africa, and Rest of MEA. Readers can also find regional trends, regulations, and market growth based on product type, indication, and end user. This chapter also includes market attractiveness analysis, key market participants, intensity mapping, drivers and restraints, and impact analysis. This chapter explains the impact of different forecast factors in sleep aid devices market. This chapter explains the impact of different factors on the size of the sleep aid devices market size and its relative weightage. In this chapter, the readers can find detailed description of the market structure by tier, market share analysis (2017) by region for top players, and product intensity mapping by key manufacturers. This chapter includes competition dashboard, competition benchmarking, profitability, and gross margin analysis by competition and company profile of key players. This chapter includes a detailed analysis of the growth of the global sleep aid devices market along with the regional assessment including North America, Europe, CIS & Russia, Latin America, Asia Pacific Excluding China, China, and Middle East and Africa. In this chapter, readers can find information about the key trends and developments in the sleep aid devices market and market attractive analysis by region. The sleep aid devices market is segmented by product, indication, and end user. In this chapter, readers can find information about key trends and developments in the sleep aid devices market and market attractive analysis based on product, indication, and end user. This chapter includes a market value analysis by all segments, year-on-year growth analysis by all segments, and absolute $ opportunity. This chapter helps readers to understand the research methodology followed to obtain various conclusions, important qualitative information, and quantitative information about the sleep aid devices market. Major manufacturers such as, Simmons Bedding Company LLC, Tempur Sealy International, Sleep Number Corporation, ResMed, Koninklijke Philips N.V, and Dreams have a promising revenue share in the sleep aid devices market. These companies are endeavoring to launch novel product lines in the sleep aid devices market. Companies operating in the sleep aid devices market are focusing on merger and acquisition strategies to expand their portfolio. To expand in the sleep aid devices market, the companies are working in collaboration with local wholesalers, distributors, and retailers. Local companies are contending based on pricing and effective channel management in the market. The mattress and pillow segment is the major revenue contributor in the sleep aid devices market. Globally, sleeping disorders are increasing and becoming a severe ongoing struggle for the world population. 50-70 million adults in the U.S. are suffering from sleep disorders, 48.0% of the U.S. adults report snoring. Insomnia is the most common sleep disorder, with short-term issues reported by about 30% of adults and chronic insomnia by 10%. Around 25 million U.S. adults have obstructive sleep apnea (OSA). Increasing prevalence of sleep disorders, such as insomnia, OSA, and CSA, has increased the demand for sleep aid devices, which are the prime solution for proper sleep. Due to various adverse physiological and paradoxical effects of sedatives and hypnotics, along with a risk for development of dependence and abuse, sleep aid devices are preferred. An occurrence of a wide variety of serious allergic, hepatotoxic, and hematologic reactions to sedatives and hypnotics is possible. Geriatric population is increasing globally. According to the National Institutes of Health (NIH), around 8.5% of the world population was aged 65 or above in 2016, and by 2050 this percentage is expected to grow to around 17%. Sleep disturbance is very common in the geriatric population. Multimorbidity, polypharmacy, and certain sleep disorders are very common in the elderly population and adversely affect their normal sleep pattern. Currently, lifestyle-related diseases such as atherosclerosis, heart diseases, stroke, obesity, type 2 diabetes, and diseases associated with smoking, alcohol, and drug abuse are rising globally. Sleep apnea is one of the comorbidities associated with these lifestyle-related diseases. Thus, the rise in geriatric population and other lifestyle-related diseases is consequently expected to impact the growth of the sleep aid devices market in a positive way. According to the U.S. Bureau of Economic Analysis, there was around 8% increase in disposable personal income in the U.S. from September 2017 to August 2018. As a result of a rise in disposable income, consumers can afford high-cost devices. This can provide an excellent growth opportunity for the manufacturers of sleep aid devices. Sleep deprivation is associated with lost productivity as well. A study by RAND Corporation has stated that in the U.S., there are around 1.2 million lost work days per year and as a result, the economic impact of productivity losses and higher mortality rates could be over US$ 400 billion or 2 percent of GDP. Various government and non-government organizations such as Circadian Sleep Disorders Network and American Sleep Apnea Association (ASAA) are conducting various awareness programs to increase awareness about the importance of ample sleep and usage of sleep aid devices. Sleep awareness week was celebrated by the National Sleep Foundation with the theme “Begin with Sleep Moreover” in March 2018. With an increase in awareness levels and government support, people have started showing more interest in sleep aid devices. As a result, the sleep aid devices market is emerging as a huge market and several products are evolving to treat different sleep disorders. 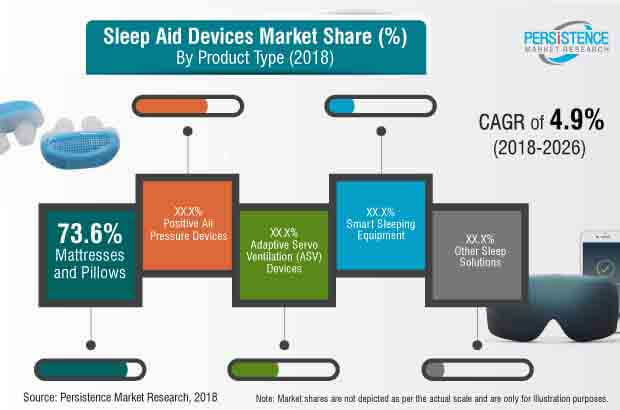 The competition section of the sleep aid devices market features profiles of key players operating in the industry based on their market shares, differential strategies, product offerings, marketing approach, and company dashboard. Some of the key players featured in this report include ResMed Inc., Fisher & Paykel Healthcare Limited, Drive DeVilbiss Healthcare LLC, Koninklijke Philips N.V., Sleep Number Corporation, Responsive Surface Technology LLC, Eight Sleep Inc., Simmons Bedding Company LLC, Electromedical Products International, Inc., Kingsdown, Inc., Ebb Therapeutics and Sleepace Inc.
ResMed Inc. offers a range of products for sleep aid devices, which include positive air pressure devices for treatment of sleep apnea. Popular brands of the company include Lumis 150, AirSense, Elite, AirMini, Lumis, AutoSet, AirCurve, etc. The key manufacturers of sleep aid devices are focusing on novel marketing strategies to increase product penetration. Most of the companies are focusing on acquisitions, mergers, expansion, launches, and agreements as the key strategies to increase the sale of their products in different geographies. Sleep aid devices are medical devices that help a person to fall asleep. Sleep aid devices are used for the treatment of sleep disorders and disturbed sleep. Research studies have been conducted on the sleep aid devices market for the forecast period 2018 to 2026. The sleep aid devices market report offers a comprehensive evaluation of the business opportunities prevailing in the sleep aid devices market along with insights on the trends, market dynamics, market opportunity analysis, and market competition. The report elaborates on the macroeconomic factors influencing the dynamics of the sleep aid devices market and its futuristic potential. The report offers a comprehensive taxonomy of sleep aid devices market based on product type, indication, end user, and region. Sleep aid devices include Positive Air Pressure Devices, Adaptive Servo Ventilation (ASV) Devices, Mattresses and Pillows, Smart Sleeping Equipment, and other sleep solutions. By indication, sleep aid devices can be segmented as sleep aid devices for insomnia, sleep aid devices for sleep apnea, sleep aid devices for restless legs syndrome, sleep aid devices for narcolepsy, and sleep aid devices for sleep deprivation. Among these disorders insomnia is the most common sleep disorder, with short-term issues reported by about 30% of adults and chronic insomnia by 10% in the U.S. End-use segments in sleep aid devices market which are a part of this sleep aid devices market report include hospitals, sleep clinics, and homecare settings. The sleep aid devices market has been analyzed across regions of North America, Latin America, Europe, Asia Pacific Excluding China, China, and MEA. What is the revenue potential of the sleep aid devices market across North America and Europe? Who are the key competitors and what are their portfolios in sleep aid devices market? What are major challenges influencing the growth of the sleep aid devices market? How intervention from regulatory authorities is shaping the sleep aid devices market growth?